1" Polyester Satin Tufted Bench Cushion - FREE S&H is rated 4.86 out of 5 based on 11 ratings. These cushions stand up to a lot of sitting down!! 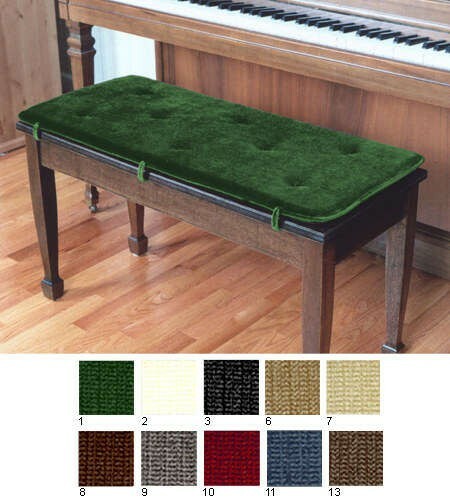 Our 1" tufted piano bench cushions have 8 sewn tufts (no buttons). The cushions have 3 ties on each side so you can attach the cushion to the lid of the piano bench. Made of soil and stain resistant satin polyester, the cushions come in 13 colors and in 6 sizes (plus custom). We've sold these cushions for over 23 years and they are long lasting favorites! You can now have us make a custom-size cushion to perfectly fit your bench or church pew! Current maximum size is 20" wide by 90" long. If you need a custom size, you may call us at customer service 800-792-4457 or look at our item 30075_C.